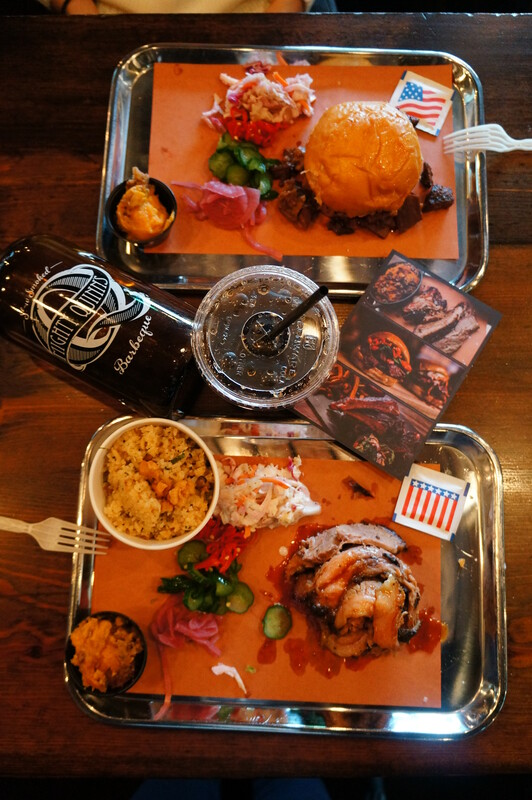 Coming from New York, The Mighty Quinn’s has already become a firm BBQ favourite in the city that never sleeps. From the outside, walking in, you can decide what you’d like to eat. But, let’s face it, you are probably going here knowing exactly what you want, right? The menu oozes with everything you want to read at a BBQ place, nobody can deny Mighty Quinn’s of that. But, they do more than just BBQ, clearly. At $280 for a pint of beer, it is on the expensive side. However, they have the buzzword ‘craft’ up there, so I am sure it is a popular choice for many. It’s an organised line at Quinn’s, with two chefs plating up and one guy taking the money whilst doing the drinks, too. The inside space is plentiful and the decor basic but nice. Here, the chef is cutting my brisket up into a portion and plating it up. At the table, let the camera eat first. Dripping with sauce and looking incredible, my brisket sits and waits for me. We chose the brisket to be accompanied by the dirty rice, which was delicious! As for taste, it hits the spot right away. The flavours are awesome and the fat silky smooth and melt-in-your-mouth. However, what doesn’t quite feel right is eating cool, almost cold meat. The meat has been left out in the AC’d environment for such a time that it has been allowed to reach that point inbetween cool and cold. Not what you expect from such an establishment. Photographing beautifully, are the burnt ends. We chose to have it with bread and slaw. The slaw is great, as is the bread. The burnt ends themselves, are also really very good. They are full of flavour. However, next time, I would get this with the dirty rice and probably get the brisket with the bread, as after a few bites the burnt ends and the bread began to get a bit dry. Note to self. Overall, an alright experience. Get warm meat, and I will be a regular.